Select the required working height. The working height will be based on the platform height of the scaffold plus 2 meters. Limited space for your scaffold? Choose a small scaffold (0,75 m or 0,90 cm, single platform). Need more workspace? Choose a double width scaffold (1,35 m, double platform). Are you often working alone? Altrex has developed scaffolds which can be assembled by 1-person. Traditional scaffolds must be assembled by at least 2 people. The base of a folding scaffold has a fixed folding unit. Rolling scaffolds consist of loose components. A stairway scaffold has a stairs inside the scaffold. Are you familiar with our scaffold series? Choose your serie here. In just three steps you will find the most suitable scaffold for your needs. 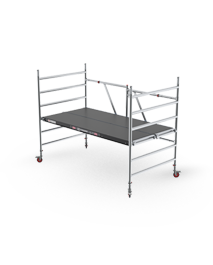 The Altrex scaffold configurator will help you find your most suitable scaffold. Make use of the filter options below. Based on your needs, you will get personal advice. Request a quotation by sending this configuration or by going to an Altrex dealer. Do you still have a large number of scaffolds to choose from? Please indicate more variables so we can give you a more specific advice. After you have made an initial selection you can compose the scaffold further to you needs by using the following steps. Or adding additional accessories and components for even more convenience when using the scaffold. The MiTOWER is the first Single-Person Quick-Assembly rolling tower. Safe and quick, single person assembly and disassembly within 10 minutes. Simple and compact transportation due to trolley creation. The MiTOWER has a 6,0m working height. Very usefull if you often work alone. The MiTOWER PLUS can be assembled safely and quickly in 12 minutes by 1 person. Whilst it can be used by 2 people at the same time. 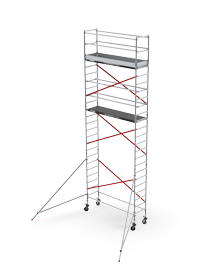 The MiTOWER PLUS is simple and compact to transport due to trolley creation and has a working height of 8 m.
The RS TOWER 51 is the best scaffold within the Altrex assortment. The RS TOWER 51 also offers many combination possibilities (Extension console, Stages, MTB etc). With a single platform width, this small scaffold is suitable if limited space is available. 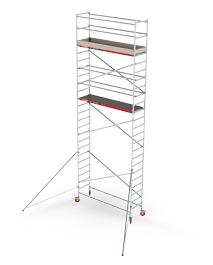 The RS TOWER 52 is the best scaffold within the Altrex assortment. The RS TOWER 51 also offers many combination possibilities (Extension console, Stages, MTB etc). 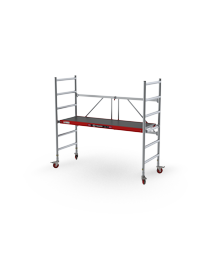 With a double platform width, this wide scaffold is suitable when you require a bigger working surface. 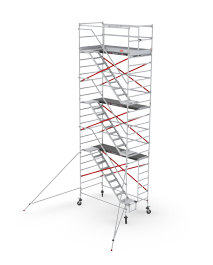 The RS TOWER 53 is a stairway scaffold and has a stairs within the scaffold. Very convenient when you often have to go up and down or if you have to carry a lot of tools. 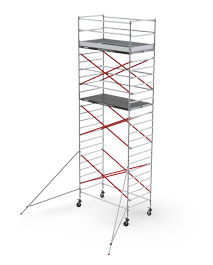 The RS TOWER 41 is a complete professional scaffold. With a single platform width, this small scaffold is suitable if limited space is available. 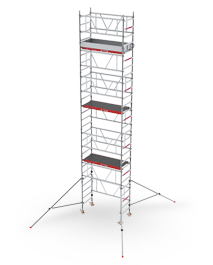 The RS TOWER 42 is a complete professional scaffold. 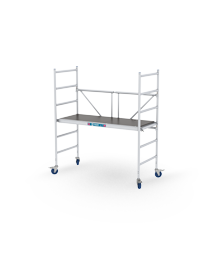 With a double platform width, this wide scaffold is suitable when you require a bigger working surface. The RS TOWER 54 is the best scaffold within the Altrex assortment. The base is a folding scaffold. With a single platform width, this small scaffold is suitable if limited space is available. 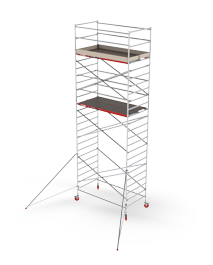 With additional parts, the RS 54 TOWER can be extended up to a working height of 9,8 m.
The RS TOWER 55 is the best folding scaffold within the Altrex assortment. 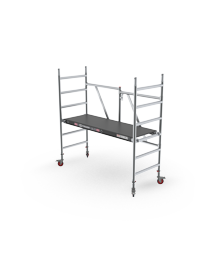 With the telescopic folding unit, this scaffold is can be adjusted for 1.85 m, 2.45 m or 3.05 m platforms. Due to its double platform width, this wide scaffold is suitable when you require a bigger working surface. With additional parts, the RS 55 TOWER can be extended up to a working height of 13,8 m.
The RS 44 POWER is a complete professional scaffold. The base is a folding scaffold. 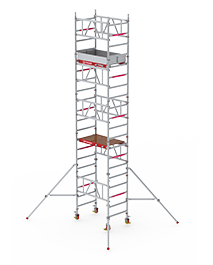 With additional parts, the RS 44 POWER can be extended up to a working height of 7,8 m.
The RS TOWER 34 modul A,B,C,D is a scaffold with a working heigt of 7,8 m. Suitable for both intensive handymen and professional users. result found. please click here for results. results found. please click here for results.